With environmental regulations expected to come under heavy fire from the Trump administration, new research offers powerful evidence of a link between air pollution and dementia risk. For older women, breathing air that is heavily polluted by vehicle exhaust and other sources of fine particulates nearly doubles the likelihood of developing dementia, finds a study published Tuesday. And the cognitive effects of air pollution are dramatically more pronounced in women who carry a genetic variant, known as APOE-e4, which puts them at higher risk for developing Alzheimer’s disease. In a nationwide study that tracked the cognitive health of women between the ages of 65 and 79 for 10 years, those who had the APOE-e4 variant were nearly three times more likely to develop dementia if they were exposed to high levels of air pollution than APOE-e4 carriers who were not. Among carriers of that gene, older women exposed to heavy air pollution were close to four times likelier than those who breathed mostly clean air to develop “global cognitive decline” — a measurable loss of memory and reasoning skills short of dementia. While scientists have long tallied the health costs of air pollution in asthma, lung disease and cardiovascular disease, the impact of air pollutants on brain health has only begun to come to light. This study gleans new insights into how, and how powerfully, a key component of urban smog scrambles the aging brain. Published Tuesday in the journal Translational Psychiatry, the research looks at a large population of American women, at lab mice, and at brain tissue in petri dishes to establish a link between serious cognitive decline and the very fine particles of pollution emitted by motor vehicles, power plants and the burning of biomass products such as wood. All three of these biomedical research methods suggest that exposure to high levels of fine air pollutants increases both dementia’s classic behavioral signs of disorientation and memory loss as well as its less obvious hallmarks. These include amyloid beta protein clumps in the brain and the die-off of cells in the brain’s hippocampus, a key center for memory formation. Using air pollution standards set by the U.S. Environmental Protection Agency, researchers found significant differences on all those measures between those who breathed clean air and those exposed to pollution levels deemed unsafe. In lab mice, breathing air collected over the 10 Freeway in Los Angeles led to brain concentrations of amyloid protein that were more dense and more likely to form dangerous clumps than breathing air that satisfied EPA standards before 2012. When lab mice were bred with a strong predisposition to develop dementia and its hallmarks, the brain differences between pollution-breathing animals and those that breathed clean air were starker. In 2011, a study in the journal Lancet found that those who lived close to densely trafficked roads were at a far higher risk of stroke and dementia than those who lived farther away. A year later, a team led by Alzheimer’s disease researcher Dr. Samuel Gandy at Mt. Sinai in New York first established that air pollutants induced inflammation, cell death and the buildup of amyloid protein in the brains of mice. The new study extends those findings. Authored by geriatric and environmental health specialists at USC, the new study estimates that before the EPA set new air pollution standards in 2012, some 21% of new cases of dementia and of accelerated cognitive decline could likely have been attributed to air pollution. There is potential legal significance to the researchers’ finding that women (and mice) who carried a genetic predisposition to developing Alzheimer’s disease were far more sensitive to air pollution’s effects. In devising pollution standards, the EPA is currently required to consider their health impact on “vulnerable populations.” The agency is also required to use its regulatory authority to take steps to protect those populations. Air pollution has been declining steadily since the EPA promulgated new standards in 2012. But Dr. Jiu-Chiuan Chen, an environmental health specialist at USC’s Keck School of Medicine and the study’s senior author, said it’s not clear that even current standards are safe for aging brains, or for brains that are genetically vulnerable to Alzheimer’s. The Trump administration has signaled it will look to scrap or substantially rewrite Obama administration regulations that tightened emissions from power plants and established tougher fuel efficiency standards for cars in an effort to curb climate change and reduce air pollution. “If people in the current administration are trying to reduce the cost of treating diseases, including dementia, then they should know that relaxing the Clean Air Act regulations will do the opposite,” Chen said. About 10% of dementia cases in people living within 50m of a major road could be down to traffic, the study suggests. The study in the Lancet followed nearly two million people in the Canadian province of Ontario, between 2001 and 2012. There were 243,611 cases of dementia diagnosed during that time, but the risk was greatest in those living closest to major roads. The analysis suggests 7-11% of dementia cases within 50m of a major road could be caused by traffic. Dr Hong Chen, from Public Health Ontario and one of the report authors, said: “Increasing population growth and urbanisation have placed many people close to heavy traffic, and with widespread exposure to traffic and growing rates of dementia, even a modest effect from near-road exposure could pose a large public health burden. The researchers suggest noise, ultrafine particles, nitrogen oxides and particles from tyre-wear may be involved. However, the study looks only at where people diagnosed with dementia live. It cannot prove that the roads are causing the disease. “This is an important paper,” says Prof Martin Rossor, the UK’s National Institute for Health Research director for dementia research. Prof Tom Dening, the director of the Centre for Dementia at the University of Nottingham, said the findings were “interesting and provocative”. He said: “It is certainly plausible that air pollution from motor exhaust fumes may contribute to brain pathology that over time may increase the risk of dementia, and this evidence will add to the unease of people who live in areas of high traffic concentration. The best advice to reduce the risk of dementia is to do the things that we know are healthy for the rest of the body – stop smoking, exercise and eat healthily. 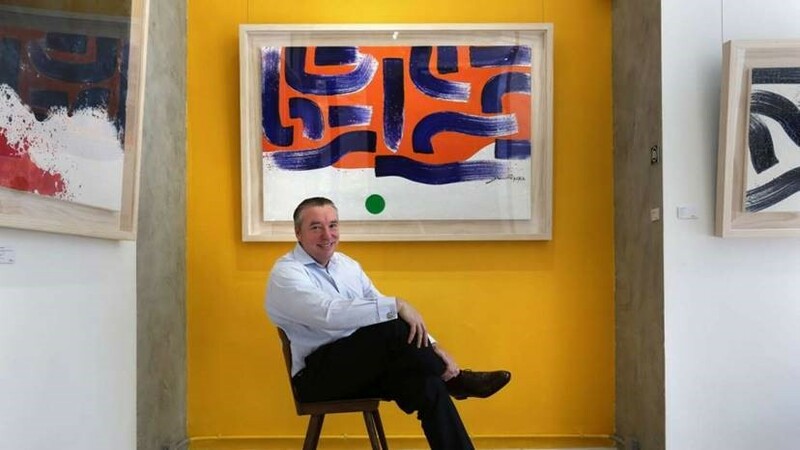 Former banker and now art gallery owner Mark Peaker attributes the success of both his careers to his jovial nature. But there’s one group of people to whom the British-born Hongkonger shows no mercy – the city’s perennial engine idlers. “It’s my biggest bugbear about Hong Kong – these belligerent drivers who clog up the roads and won’t turn their engines off,” Peaker, who owns gallery 3812 in Sai Ying Pun, says. As an avid letter writer to the South China Morning Post, “Mark Peaker from The Peak” is noted for his regular commentary and complaints on discourteous road etiquette, which remains unchanged despite a bill being introduced in 2011 penalising those who idle their engines. A community man who has called the city home for more than 12 years, Peaker canvasses almost daily for better enforcement of the Motor Vehicle Idling Ordinance over the habit that is not only a nuisance to those navigating the tight streets, but also makes Hong Kong smog levels all the worse. “When you first arrive in Hong Kong, you’re not part of the community and you don’t really get invested in this sort of thing but then you adapt to your environment,” he said. Peaker said he struggles to understand why enforcement on the matter is so limp. He has acquired a certain degree of notoriety among officers for his querying their enforcement tactics, adding with an air of exasperation that they do not seem to approach the matter as assertively as they ought to. Born in Cambridge to a diplomat father and stay-at-home mother, Peaker was brought up in well-to-do west London. He moved to Hong Kong at a time when he felt his career as a banker was coming to a close. 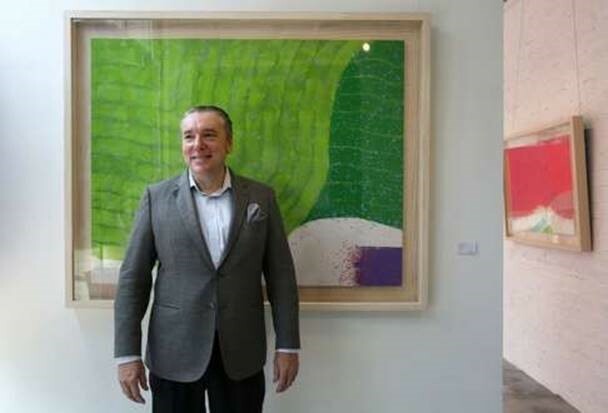 A man of good taste and a natural networker, he found himself drawn to the art world, deciding more than seven years ago to set up a gallery of contemporary art alongside his partner, art aficionado Calvin Hoi. He says what drew him to the city – the diversity, the hustle and bustle, the cityscapes and energy – are qualities that have him still very much in love with Hong Kong, despite its problems. “Hong Kong has always fascinated me, I’m an urban dweller at heart – and this place has a lot to offer everyone,” he says, describing how he also enjoys hosting ¬acting classes for students as part of his community work with NGO Shakespeare for all, alongside sketching workshops in a separate pro bono project. “There are so many positives, it’s such a vibrant place, and sometimes we lose sight of that,” he adds. Peaker is not alone in his crusade against the scourge of idling engines across Hong Kong. Since 2006, 8,337 complaints about idling engines have been made to the Environmental Protection Department, the body tasked with penalising offending drivers. Despite this, only 201 fines have been issued by the department since the Motor Vehicle Idling Ordinance came into operation in 2011. The number of fines amounts to just 4.4 per cent of complaints made since that year. And at HK$320 a pop, many consider the fines to be ineffective deterrents. “The fine is ridiculous, and the belligerent attitude of the drivers means a lot of the time police don’t even enforce the rules,” Peaker said. But he thinks the Hongkongers who deserve the blame for the lines of chugging engines across the city are the well-to-do who require their drivers to wait endlessly for them to appear. “They have this self-belief that they’re so important they’re above the law,” Peaker said, describing how on several occasions he had seen drivers ignore inspectors and police officers asking them to turn off their engines. He describes an email flow that spans years. Environmental campaigner at Clear the Air, James Middleton, agrees that the ordinance can hardly be described as a success. He said it had had “zero” effect on pollution levels. (3) given that the Commissioner for Transport indicated in an article published in a newspaper on March 8 of this year that, as pointed out in past studies, CWB would render no direct help to easing traffic congestion on non-major trunk roads (e.g. Queen’s Road Central and Des Voeux Road Central) within Central, and at the time a large number of vehicles that needed to go into Central would still be using these roads, and the authorities therefore did not expect that the traffic congestion in the locations concerned would be much improved, of the details of the aforesaid studies and the data in support of the aforesaid conclusion? The Central-Wan Chai Bypass (CWB) is a strategic route along the northern shore of the Hong Kong Island, aiming to alleviate the serious traffic congestion at Connaught Road Central, Harcourt Road and Gloucester Road.It is anticipated that upon commissioning, drivers whose origins and destinations are not in Central will no longer use the current major trunk road that runs through Central from east to west (viz. Connaught Road Central).However, those drivers whose origins or destinations are in Central will still have to use the non-major trunk roads (e.g. Queen’s Road Central and Des Voeux Road Central). The CWB project is a large-scale and complex road infrastructure project.It has encountered various difficulties and challenges since construction commenced in 2009 which affected the progress of works.Part of the construction of the CWB tunnel structure that has been entrusted by the Highways Department (HyD) to the Civil Engineering and Development Department (CEDD) to be carried out under the Wan Chai Development Phase II project (WDII), is part of the main trunk road of the CWB.The large metal object that was previously found at the seabed of the WDII works site caused suspension of reclamation and associated works in the area.After the reclamation works resumed in early July 2015, the CEDD notified the HyD of the revised site handing over schedule after the recommencement of works.The CEDD estimated that the section concerned of the CWB tunnel could only be completed for handing over to the HyDÂ¡Â¦s contractor for carrying out the subsequent works in mid-2017.As such, the HyD anticipated that the related subsequent works like installing various electrical and mechanical facilities (including a traffic control and surveillance system, a tunnel ventilation system, a lighting system and a fire services system), laying road pavement and carrying out system testing and commissioning, could not be completed within the same year.In other words, the CWB could not be commissioned in 2017 as originally scheduled.The HyD together with their consulting engineer and resident site staff will continue to closely monitor the works progress of the CWB project and will duly assess the schedule of works with the aim of commissioning the CWB as early as possible. As shown from the above table, at the initial stage of commissioning of the CWB, the v/c ratio in the morning peaks is 0.7, meaning that at its initial stage of commissioning, the capacity of the CWB is sufficient to cope with the anticipated traffic volume with a smooth traffic flow.Therefore, it is anticipated that same as the original estimates, it will only take about five minutes to drive from Central to the Island Eastern Corridor at North Point.Also as shown from the above table, at the initial stage of commissioning of the CWB, the v/c ratios of Connaught Road Central, Harcourt Road and Gloucester Road will decrease from 1.3 to 0.9.Therefore, the Government anticipates that upon commissioning of the CWB, the traffic congestion at Connaught Road Central, Harcourt Road and Gloucester Road can be alleviated. However, the CWB will bring no direct relief to non-major trunk roads (e.g. Queen’s Road Central and Des Voeux Road Central) in Central.After the commissioning of the CWB, these roads will still be used by a large number of vehicles which need to enter Central.As such, the traffic condition in the district is not expected to improve significantly.With reference to the information in the Supplementary Note provided by the Government to the Expert Panel on Sustainable Transport Planning and Central Â¡V Wan Chai Bypass under the Harbour-front Enhancement Committee (Note 2) in 2005, the same conclusion could be drawn – after the commissioning of the CWB, traffic congestion will only be slightly alleviated during peak hours at certain busy junctions in Central (e.g. the junction of Pedder Street and Des Voeux Road Central, and the junction of Queen’s Road Central and Ice House Street (Note 3)). Note 1: Volume/capacity (v/c) ratio is an indication of the traffic conditions of roads during peak hours. A v/c ratio equals to or less than 1.0 is considered acceptable. A v/c ratio between 1.0 and 1.2 indicates a manageable degree of congestion. A v/c ratio above 1.2 indicates more serious congestion. Note 2: Please see Appendix 4.6B of Supplementary Note No.5 (www.harbourfront.org.hk/eng/content_page/doc/SN-en.pdf). Note 3: The performance of a traffic signalised junction is indicated by its reserve capacity (RC).A positive RC indicates that the junction is operating with spare capacity; and a negative RC indicates that the junction is overloaded, resulting in traffic queues and longer travelling time.After the commissioning of the CWB, the RC of the junction of Pedder Street and Des Voeux Road Central and the junction of Queen’s Road Central and Ice House Street during peak hours are expected to improve from 2% to 6% and from -3% to 5% respectively. Drivers in Central blackspots were caught out on Wednesday as ¬police launched a week-long, ¬city-wide crackdown on illegal parking. Those expecting the leniency they were accustomed to were in for a surprise; they ended up complaining that the operation was “unfair”, as police enforced HK$320 fines only minutes after the drivers parked their vehicles ¬illegally, and without warning. While traffic police swooped on blackspots, the uphill battle against illegal parking was evident as it was back to business as usual when the officers moved on. A Filipino professional driver was one of those given a ticket for waiting for his boss in a restricted area on Lyndhurst Terrace at around 1pm. The driver, 56, who refused to give his name, said he had parked there almost every day for the past few years as his boss would have lunch nearby. “[This is] the first time I have got a ticket in this area. I have worked as a driver in Hong Kong for 20 years,” he said, adding that he was unaware of the police ¬operation, which was announced last week, and questioned whether he had even broken the law. “This is an open area. There is no sign. Suddenly they came and gave me a ticket … no warning,” he said. He said the officer, who spoke in Cantonese – a language the driver was not fluent in – would only tell him “it is ticketing time”. Police have vowed to be tough during the seven-day operation. Their focus is on double-parking and stopping in restricted zones. Central and Kowloon Tong – notorious for traffic congestion as a result of illegal parking – were among areas targeted on Wednesday. A local woman was given a ticket for double parking at noon on the same road in Central where the Filipino driver was caught out. “I am not familiar with this area,” she said. The officer involved told the woman “even one minute would not work”, as her car was blocking others from turning. On Wellington Street, the Post saw an officer take only two minutes to ticket a white BMW. In Yau Ma Tei, a 57-year-old driver and his 44-year-old passenger were arrested for disorder in a public place after they were allegedly uncooperative and yelled at the police officer who fined them for illegal parking. The driver, surnamed Lam, parked his car outside 3 Waterloo Road. But in Kowloon City, another notorious blackspot, drivers ¬defied the crackdown with rampant double and triple parking. Central district councillors on Thursday united in bashing the government’s plan to introduce electronic road pricing in the neighbourhood, saying the policy by itself could not ease chronic road congestion and pollution in Hong Kong’s core business district. They argued the government should instead prioritise confronting problems such as rampant illegal parking and the lack of parking spaces. Liberal Party councillor Joseph Chan Ho-lim, representing the Peak constituency, said the root cause of traffic jams in Central was widespread double-parking in key arteries such as Queen’s Road Central and Chater Road. “Right now, the problem of severe congestion in Central is not about more cars or fewer cars coming to Central. The problem is the cars in Central don’t move at all,” said Chan. “Why the cars don’t move? It’s because of illegal parking … parts of the roads are always blocked. Council vice-chairman Chan Hok-fung questioned why a road tax was needed at all. “It’s illegal parking. We said this 90,000 times in district council … but nothing was done to alleviate [it],” said Chan of the Democratic Alliance for the Betterment and Progress of Hong Kong . The bypass is a highway being built to alleviate congestion in Central, but it will not open in 2017 as scheduled because of technical difficulties. Cheng lai-king, of the Democratic Party, worried the road tax would be implemented at the expense of residents in Mid-Levels. Kam Nai-wai, of Sheung Wan constituency, blamed the government for creating the congestion in the first place because of poor town planning. In response, principal assistant secretary for Transport and Housing (Transport), Cordelia Lam Wai-ki, reiterated the administration currently holds “an open attitude” on electronic road pricing, which is only one of the 12 suggestions it was studying to ease traffic jams in the city. “We are not only relying on electronic road pricing to solve traffic congestion,” said Lam. “Last year, the Transport Advisory Committee suggested to increase fixed the penalty for illegal parking by 50 per cent from HK$320 to HK$488. We are working on it. The public consultation on the road tax ends next Friday.